Here is another Christmas gift for a young girl. This headband is easy. The flower is pretty easy too. I made this in under an hour. 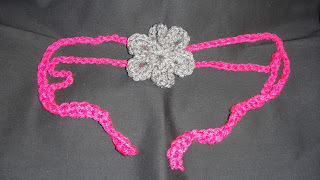 You can find the FREE PATTERN for this headband and flower at CreativeMe. **If you would like me to make any of my projects for you, please Or you can contact me through my Etsy Shop.